Cocktailiana » Blog Archive » We like it Spicy! Mixing up some Indian cocktails for Mixology Monday. It turns out that this couldn’t really be better timed for me as I have been obsessed with spices in cocktails recently. About a month ago some friends and I planned to go see Slumdog Millionaire, the new Danny Boyle film about an Indian kid who ends up on Who Wants to Be a Millionaire, and spends the film reflecting on his past in the slums of Mumbai. We were all getting together before the film and I was asked to come up with some Indian themed cocktails. Well, after a bit of research, it turned out there weren’t really many non-lassi based drinks out there that were Indian themed. This surprised me considering how flavorful indian food is. Scott Beattie had a few recipes that were inspiring in their use of coconut milk and cilantro and pickled hearts of palm but they were all really more southeast asian than Indian, and I wanted something with cumin, and coriander and turmeric. We only had a short notice to prepare for the party so I took the quick and easy route and made some syrups that would allow me to Indian-up nearly anything with some strong flavors. I made a coriander syrup and a cumin syrup. The cumin syrup turned out amazing and outrageously flavorful and only a small amount was needed to give any drink a hint of the spice route. The coriander syrup was much more subtle but intriguing to mix with as it added a flavor that was at once familiar but mysterious. The following week though, it was like the Indian-cocktail rosetta stone was recovered. That was when Jonny Raglin introduced his Spice Route cocktail menu at the new southern indian restaurant Dosa in San Francisco. It was like a trip though a new world of cocktail flavors, darjeeling tea cordial, mango gastrique, curry nectar, hell-flower tincture, yogurt. It sounded amazing, and after a visit, I was not disappointed. The next day I took a trip to Berkley bowl, one of the greatest produce markets i have ever been to, and picked up some kaffir lime leaves, curry leaves, celery root, cilantro, sweet limes and fresh tumeric and began experimenting. 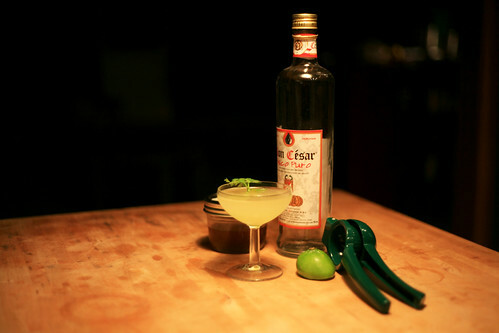 Out of that came two drinks that worked pretty well, the first was based loosely on a gimlet recipe using pisco and the coriander syrup. It is called the Dhaniya Nimbu. Dihaniya is Hindi for coriander and nimbu is Hindi for lime. The second drink was inspired very much by the drinks at Dosa, and is called the Cumin Get It, which is admittedly a pretty lame name but I couldn’t avoid such a golden opportunity for a pun. shake all ingredients except cilantro and strain into a chilled cocktail glass. Garnish with cilantro sprig. Heat coriander seeds in a hot skillet for a minute or so to release the aromatics. Add the seeds to a sauce pan and crush them with a muddler. Add the water and bring the mixture to a boil. simmer for 5 minutes and add the sugar stirring until it is dissolved. Remove from heat, let cool and strain out the coriander seeds from the mixture, bottle and refrigerate. Mixture should keep for about a week. Place all ingredients except for one of the kaffir lime leaves in a shaker and shake very well as you would a drink with egg white. 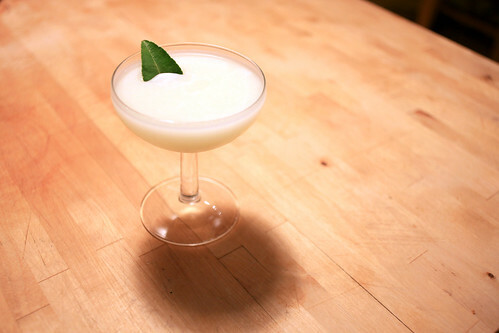 Strain into a chilled cocktail glass and garnish with remaining kaffir lime leaf. Heat cumin seeds in a hot skillet for a minute or so to release the aromatics. Add the seeds to a sauce pan and add the water and bring the mixture to a boil. simmer for 5 minutes and add the sugar stirring until it is dissolved. Remove from heat, let cool and strain out the cumin seeds from the mixture, bottle and refrigerate. Mixture should keep for about a week. This entry was posted on Monday, December 15th, 2008 at 1:53 am	and is filed under Bars, Books, Infusions, Ingredients, mxmo, people, Recipes. You can follow any responses to this entry through the RSS 2.0 feed. Both comments and pings are currently closed. Coriander is such an elegant spice. We use it a lot, and love the idea of your Dhaniya Nimbu. Can’t wait to whip up some coriander syrup and make a round or two. Cheers, Paul. I have for some time now had fresh turmeric and curry leaves in mind for experimenting with indian flavored cocktails, but last time i visited our indian shop the curry leaves were dry so i didn`t buy anything then. Cumin syrup sounds very interesting, i`ll definetily make it, like you i like spices. The cumin get it cocktail is very pretty. I have to tell you that your “Cumin Get It” has proven to be a gigantic hit here with my friends in Los Angeles, and has even started to spread to Washington DC courtesy of a traveling buddy who first had it at one my parties. Since I first served it up at my Oscar party, I hope you don’t mind that I’ve redubbed it “The Slumdog.” Even the non-gin drinkers have been converted.